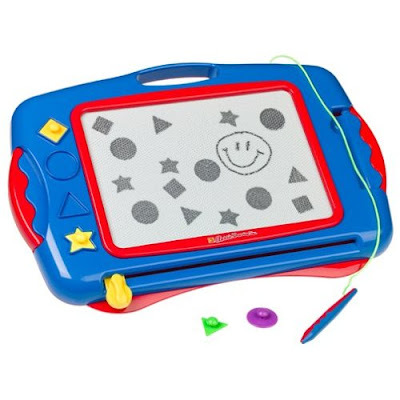 This was one of the first things we got the little one when she started 'doodling', along with crayons, drawing papers, pencils, paints & what nots. 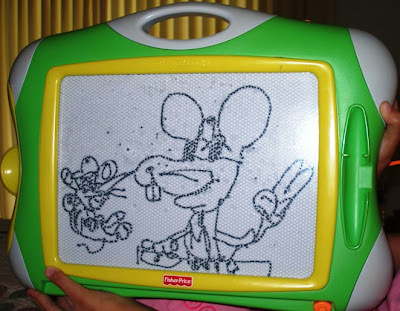 But I can say, the Magna Doodle is probably the best one. Why? 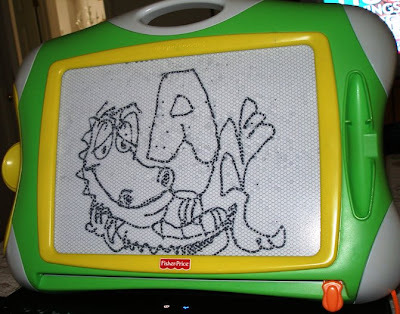 Because all the other drawing materials we got her then are all gone now, but the Magna Doodle, it's still here. She really loves this toy a lot. There is not a day she doesn't use it. If there's anything I wish this toy can do, it's to print out whatever she has doodled on it. 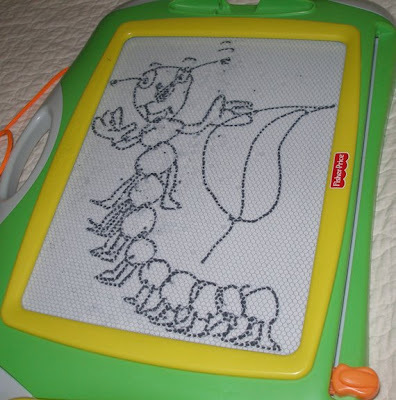 Throughout the years, she has doodled some really good stuff on this thing. But that's the fun of it I guess...she can erase it right away then go on to the next doodle. Anyway, here are some of her recent doodles. Guess who these are? Yep, US! awww.. your daughter has a future :D even i cannot draw that well! kala ko paid opp. hahahaha! Talaga naman ha, ang galing naman ng unica hija mo! She can sing, she can dance, and now, she can draw! Hhmmmmm, young artist! Kuha nga din ako ng magna doodle for Daniel, hehe. Hope you have a wonderful great week ahead Mommy J! look at that creations of your little one! WOW! wow! I'm E's fan talaga. I wished naging inaanak ko siya hahaha si that I can say mana siya sa Ninang niya. happy ako, Tuks after weeks of stressful blogging days. do you have any clue why? 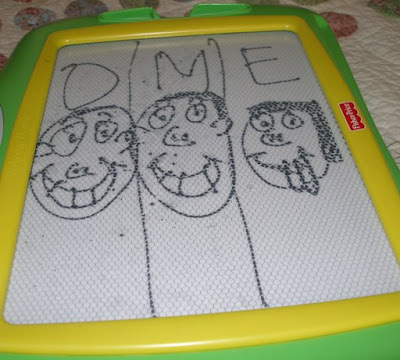 her drawings are well-proportioned. i think it's time for her to take lessons. galing namn ng baby mo magdraw...inggit ako..he..he..
hola! Tuks, o di naintriga ka. I assume you must be really itching to know why I'm so happy. no, I'm not going anywhere hahaha. ang galing naman nya. napaka husay mag drowing! Your Erika have a good hand! I can't believe Erica did those drawings! Super galing nya ha?! Napaka-blessed naman nya. Kanino ba nya namana lahat ng talents nya? Kay Mommy ba? Have a relaxing Wednesday, J! Too funny and so cute! Now that I see this, it just so happened that MS broke the doodle pen in the car earlier. Hubby said to throw the whole thing away since she tries to chew on the broken pen. Argh!